This must have been a near perfect day for any gardener – a morning spent in the garden under autumn sunshine, listening to a talk by Bob Brown in the afternoon and then buying one of his plants, a plant new to me. Bob is a most entertaining speaker, full of information, humour and original thoughts and ideas. It was when we got our plant home I first noticed the wording on the bag that held our buddleja. At the top it said “I’ve found It! and below that “Bob Brown’s Nursery” and a nice clear map. If you have ever tries to find his Cotswold Cottage Flowers (www.cgf.net) you will understand the need for the map and the meaning of the comment. 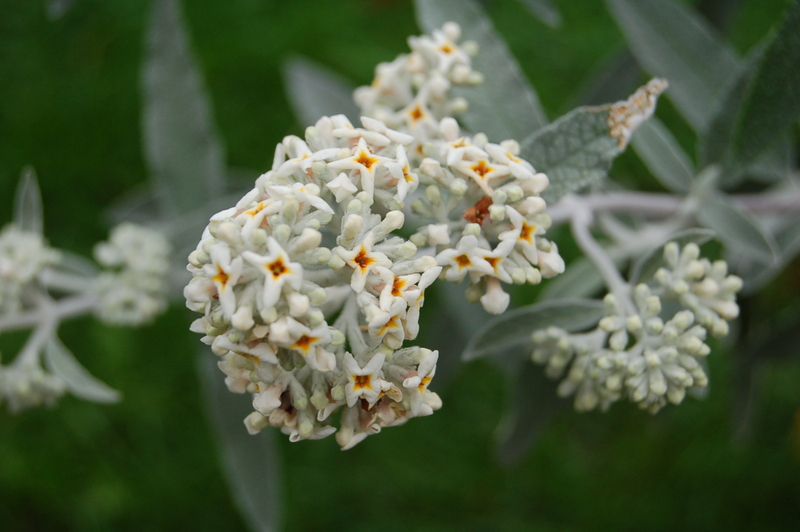 Buddleja “Morning Mist” is a cross between Buddleja crispa and Buddleja loricata. Although these parents are not hardy the cross is reputed to be a good hardy little shrub. 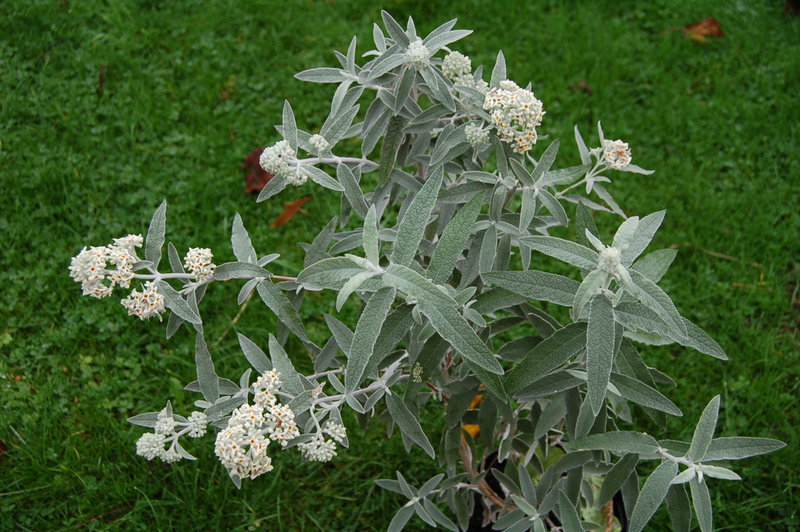 It grows into a neat metre high dome with silver foliage which is white on the underside, white soft furry stems and silver flowers with mustard centres. And it is scented with the aroma of honey! And it flowers most months of the year! A perfect plant? Mustard yellow centres add a sparkle of colour to the beautifully scented flowers. 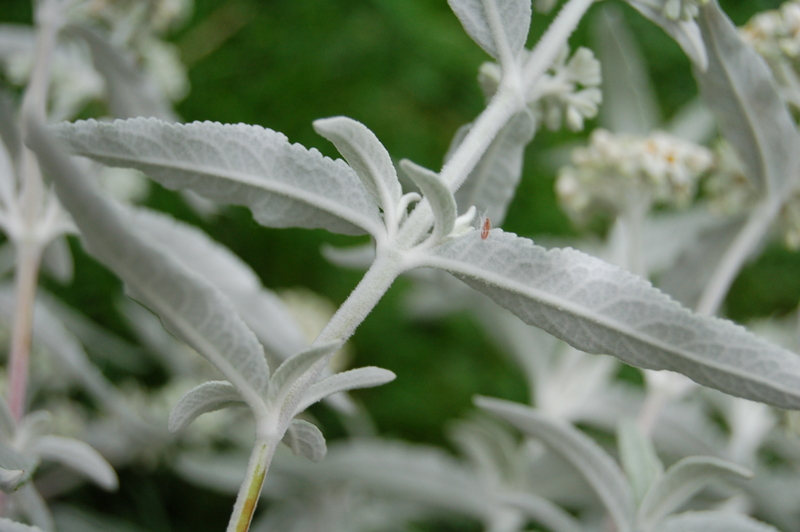 Turn the silver leaves over and the undersides are pure white and covered in gentle white fur. 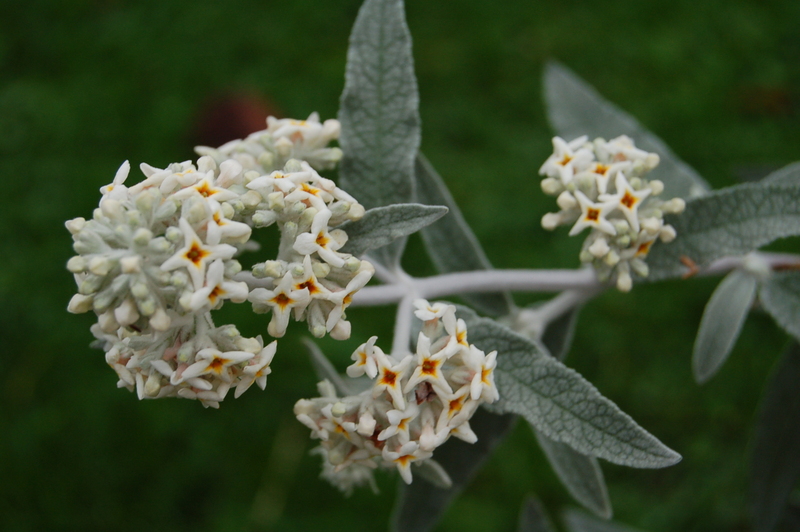 So, there it is, Buddleja “Morning Mist”. could it be the perfect garden plant. We look forward to finding out. This entry was posted in garden photography, gardening, ornamental trees and shrubs, shrubs and tagged buddleias, buddlejas, flowering shrubs. Bookmark the permalink.